If you are after a huge win then take a look at some of our progressive jackpot games. With millions up for grabs, just one spin of the reels could change your life forever. If you really want to play for the biggest possible win then at the moment you should be playing Jackpot Giant slots as it has the largest progressive jackpot on offer. With just one spin of the reels on this enjoyable game you could win a staggering £8.7 million! Jackpot Giant is a 5 reel slot with 3 rows and 50 fixed paylines. The reels are transparent and behind them you can see a grassy vista with mountains and steaming volcanoes in the distance. There are five high value symbols, pink, blue and yellow gems, and two symbols featuring the giant, one with some trees and one with a volcano. Both of the symbols featuring the giant can land stacked on the reels. There is a large gold ‘Wild’ symbol, it can substitute for all the other symbols, except the bonus scatter symbols, to help and form winning combinations. The scatter symbol features the giant’s hand and the bonus symbol features a volcano. To play for this huge progressive jackpot you need to bet the maximum per spin. Fortunately this is just £4 so most people should be able to afford to give it a try. You can then win the jackpot by landing five wild symbols along the first payline, which runs through the middle row of symbols. If you land five wilds on any other payline you will win 50,000x, a huge amount of money but nowhere near as much as the jackpot. When the volcano bonus symbol lands on reels one and five simultaneously the bonus game begins. You will see six smoking volcanoes and need to pick three of them. Each time you pick one the giant will flip a coin into the top of the volcano and award a cash prize, an extra pick or, on rare occasions, he can set off all six volcanoes at once. 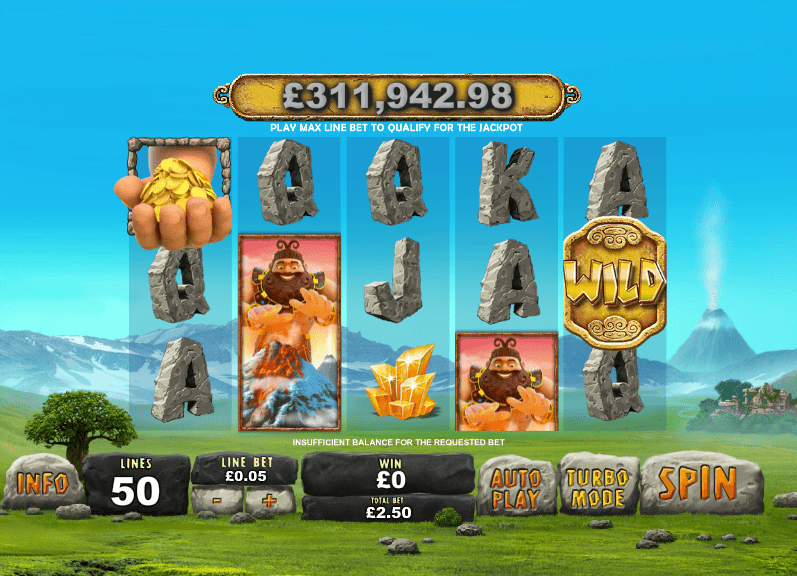 Jackpot giant has a betting range of £0.50 up to £4 per spin. As mentioned, there is a top payout of 50,000x available from the wild symbol. The pink, blue and yellow gems can payout up to 500x, 300x and 200x respectively while the giant with the volcano can payout up to 100x and the giant with trees can payout up to 80x. The scatter symbol offers payouts of up to 500x your total bet for a spin. This jackpot has been growing steadily for a long time, it must be won at some point and there is no reason why you shouldn’t be the person to win it. 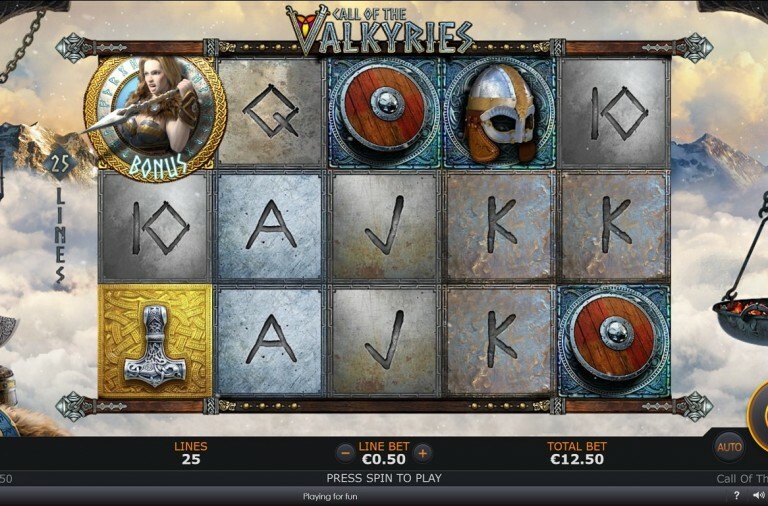 The Age of the Gods series of slots is hugely popular with players. The games are not only packed with rewarding features, but they are also linked to four progressive jackpots. Furious 4 is another of the games in the series, it offers four free spins bonus features and the chance to win a jackpot worth over £254,000. It is a 5 reel slot with 3 rows and up to 20 paylines. The reels are in a golden frame set against the sky. There are four high value symbols, the four gods Apollo, Pandora, Hephaestus and Atlas. The lower value symbols are the playing cards 9 through to A. The wild symbol is the slot’s logo, it can substitute for all the other symbols, except the scatter symbol, to help and form winning combinations. The scatter symbol is a golden throne, and it offers payouts and bonus features. To play for the jackpot all you need to do is keep the reels spinning. The jackpot game can begin after any spin, even a losing one, and once it starts a win is guaranteed. In the game there is a grid of twenty gold coins and you need to click on them to reveal which jackpot they represent. Once you have found three matching symbols you win the corresponding jackpot. From largest to smallest the jackpots on offer are: Ultimate Power, Super Power, Extra Power or Power. When three or more of the scatter symbols land anywhere on the reels you win twelve free spins. During the spins each of the four gods awards its own bonus feature when it lands stacked on the middle reel. Apollo awards the Age of Light feature, four extra spins in which he is an expanding wild. Pandora awards the Age of Curiosity, a cash prize and four spins during which the payout multiplier increases by 1x every time that Pandora appears on the reels. Hephaestus awards the Age of Fire, four extra spins with a wild reel, extra wilds added to the reels, and the other god symbols removed from the reels. Atlas awards the Age of Endurance, three extra spins in which Atlas becomes an extra wild that freezes in place when it lands. 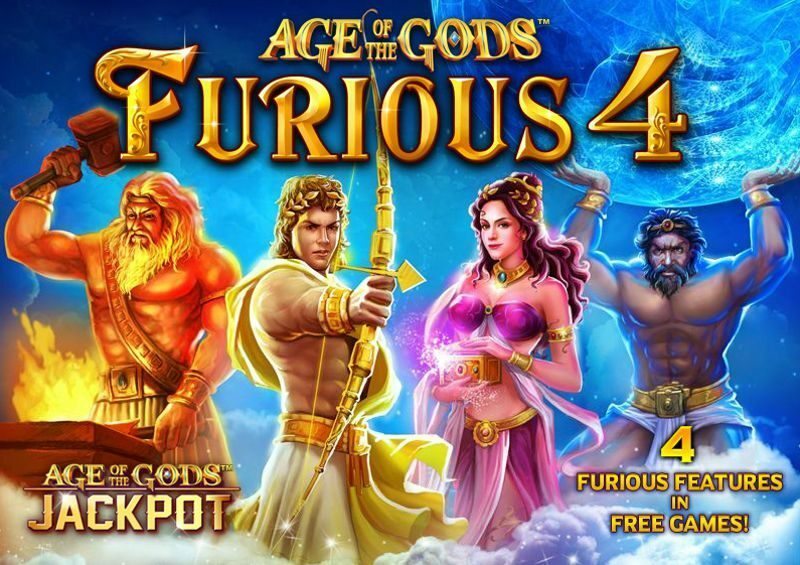 Age of the Gods: Furious 4 has a betting range of £0.01 up to £500 per spin so you can enjoy it regardless of your budget. In addition to the progressive jackpots it offers a massive fixed top payout of 10,000x for landing five of the wild symbols along a payline. Apollo can payout up to 2,000x, Pandora can payout up to 1,500x, Hephaestus can payout up to 1,000x and Atlas can payout up to 750x. Furthermore, the scatter symbol will payout an impressive 200x your total bet for a spin if five of them land anywhere on the reels. If you feel like you want to spend some time with the gods then give this slot a spin today and with a bit of luck you’ll hit the huge jackpot. Many players will have come across the slot Frankie Dettori’s Magic Seven at some time. Recently the sequel, Frankie Dettori: Sporting Legends was released. 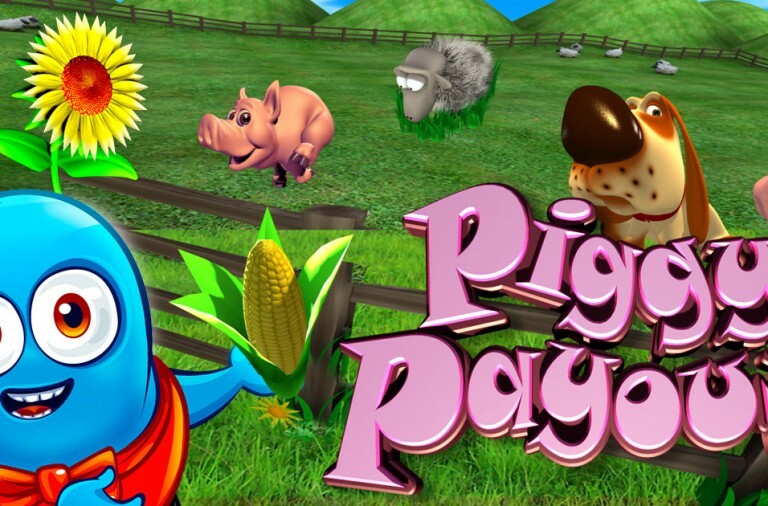 Not only does this game offer new and exciting features, but it is also linked to three progressive jackpots the largest of which is worth over £170,000. It is a 5 reel slot with 3 rows and up to 25 paylines. The reels are set against a view a horse race. There are five high value themed symbols, two featuring Frankie as well as a horseshoe, a helmet and some prize ribbons. The lower value symbols are the playing cards 10 through to A. The golden trophy is the wild symbol, it can substitute for all the other symbols, except the scatter symbol, to help and form winning combinations. The scatter symbol is a racing finishing post and it offers payouts as well as triggering the bonus feature. The progressive jackpot game may begin after any spin of the reels, even a losing one. In the game you can win the Daily Jackpot, the Weekly Jackpot and the Sporting Legends Jackpot and you are guaranteed to win one of them if the jackpot game is triggered. The Sporting Legends Jackpot is the biggest and currently worth over £170,000, as the name suggests the Daily Jackpot must be won every day (before the time shown), and the Weekly Jackpot must be won each week. In addition to the trophy wild symbol there is a special Galloping Wild. It can land stacked on the reels and when it fills the first reel the Galloping Wild Respins begin. You receive a free respin during which the Galloping Wild will move one reel to the right. If this forms a win you receive a 2x multiplier and an additional free spin. The respins continue until either no more wins land or the wild moves off the end of the reels. With each respin the payout multiplier increases from 2x to 3x to 5x to 7x. If you land three scatter symbols then the Golden Derby Free Games begin. First you need to pick from the three horses. 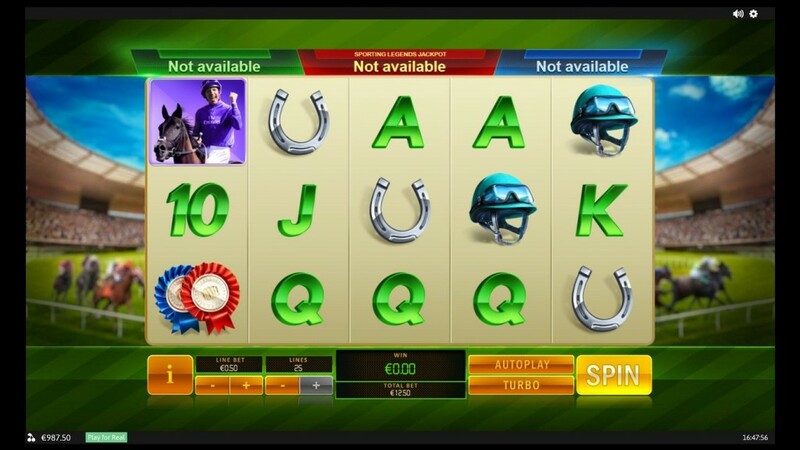 Then free spins then start and during them special red, yellow and green horse wild symbols can land on the fifth reel. Above the reels is a racetrack with the three horses racing along it. Each time one of the special wilds land the corresponding horse is moved along one place. The free spins continue until a horse has won the race. If your chosen horse wins you get a 3x multiplier and if it comes second you get a 2x multiplier. The slot has a betting range of £0.01 up to £250 per spin so everyone can play for the jackpot. There is a top payout of 10,000x available for landing five wilds along the reels. The symbol showing Frankie in blue can payout up to 1,500x, Frankie on a horse can payout up to 1,000x, the prize ribbons can payout up to 800x, the helmet can payout up to 400x and the horseshoe can payout up to 300x. The scatter symbol also offers large payouts of up to 100x your total bet for a spin. If you fancy a day out at the races then give this slot a spin today and with a bit of luck you’ll be the first winner of this progressive jackpot.